I have always been interested in the effects of war on people. 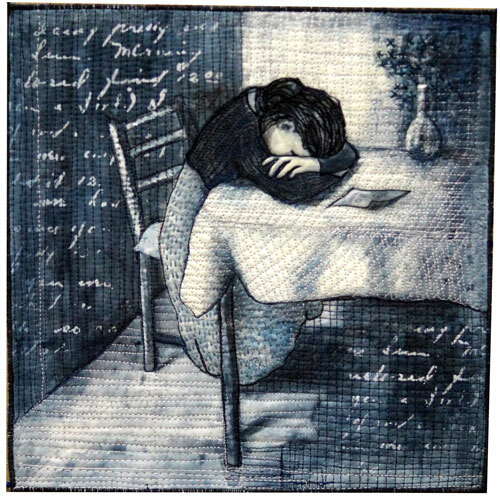 The image I have used is one I have had in my head for a while and was a very good starting point for the emotion I wanted to evoke of grief and loss of war. I used a monochromatic blue palette to keep the mood sombre. 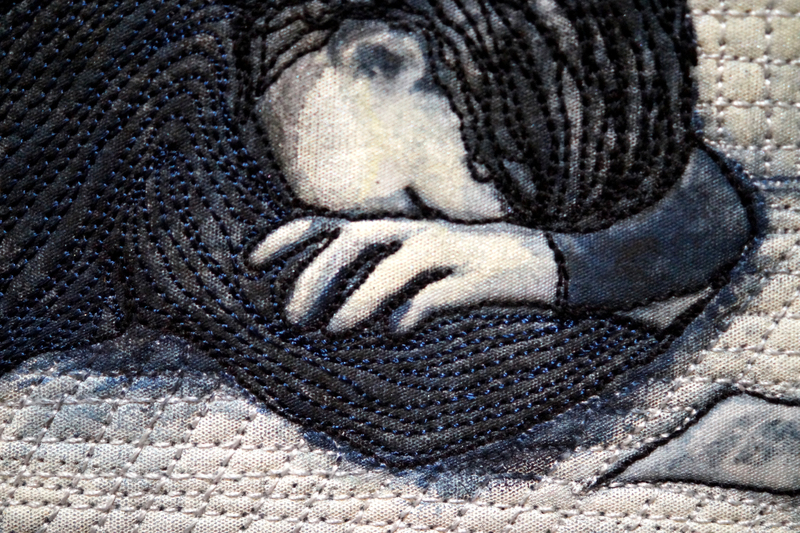 The quilt is whole cloth using dry ink media, thermofax printing, hand and machine quilted. It is very small 10″x10″. I feel very connected to this theme as my great grandfather was in the first landing at Gallipoli. He was buried alive in a bomb blast with his sergeant (who didn’t survive) and was dug out. After a while back in Australia, he disappeared and nobody knew what happened to him. My grandfather was brought up by his uncle. In 1990, my husband (a family history buff), found out that he died in WA, it seems he drowned himself. Post traumatic stress was not recognised and treated then in the way it is today. The quilt and one hundred others is currently being displayed at the Australasian Quilt Convention at the Royal Exhibition Building in Melbourne. The display will then follow the craft shows around Australia and NZ.